Xiao Bin was a worker from Da Lian, who happened to be at Beijing during the Tiananmen Massacre. 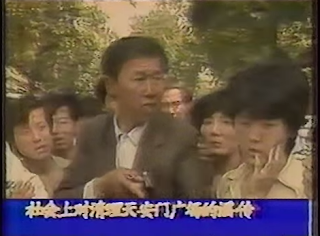 On June 5, 1989, the day after the massacre, reporters from ABC were interviewing crowds in the streets of Beijing. 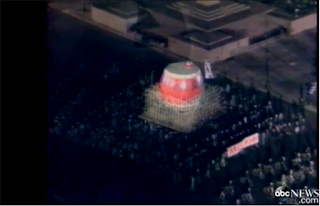 Xiao Bing provided an animated presentation of the massacre which was largely out of his own imagination, including claims of "20,000 were killed," etc. The Chinese government intercepted ABC's satellite signal and broadcast the interview on CCTV as an example of rumor-mongering. Xiao Bin's co-workers recognized him from the broadcast and turned him in. He was arrested on June 11. Although he immediately made a confession and apology on TV, he was sentenced to 10 years for "counter-revolutionary propaganda and instigation" on July 14. His prison term was longer than any of those received by student leaders. Xiao Bin served out his sentence and was released in 1999. He is unwilling to talk about his experience. On July 4, 1989, Yan Jiaqi and Wuer Kaixi became the first leaders of the 1989 movement to escape from mainland China. After reaching safety at Hong Kong, they published a statement calling for oversea Chinese to commemorate the massacre and continue on democracy movement. Their escape was helped by the "Operation Yellow Bird," a clandestine effort spontaneously organized by a group of Hong Kong people to rescue movement leaders from mainland. On June 30, 1989, Zhou Duo, who was instrumental in negotiating the withdraw of students during massacre, was arrested. 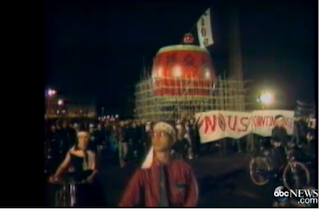 Also on this day, Beijing Mayor Chen Xitong delivered a comprehensive summary report on the 1989 movement to the People's Congress. On June 23, 1989, the Xinhua Agency announced that Liu Xiaobo had been arrested for his role in the movement. Liu Xiaobo was actually arrested on June 6 when he stepped out of a diplomat apartment in which he had been hiding. But the arrest was not made public until this day. Also on this day, People's Daily published a lengthy editorial calling for upholding the Four Cardinal Principles, mirroring the early one on April 26 that had escalated the movement.